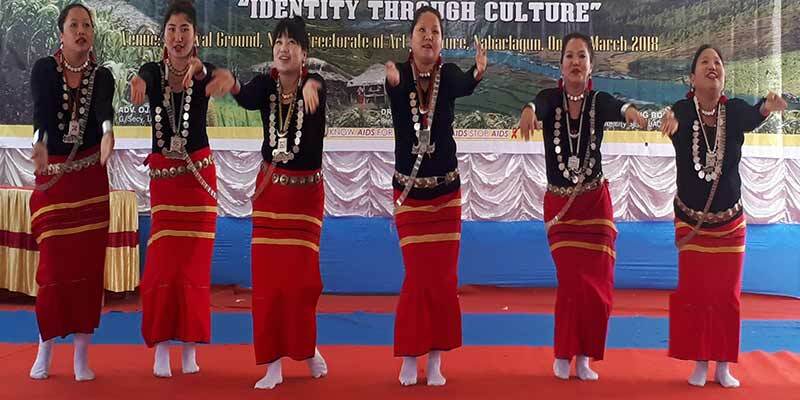 Unying Aaran festival of Adi community of Arunachal Pradesh celebrate here at festival celebration ground with great enthusiast and traditional fervour. The day long function which include cultural extravaganza, folk telling, speech on mythology of the festival and other issue related with the community living in communal harmony and well being and sharing of happiness among the family members with other and many other performances which mesmerise the huge audience gathered at the venue. Naharlagun Unying Aaran festival celebration Committee -2018 (NUAFCC) President Dr. Tagat Taggu in his address said that it is the festival which unite one all the members of the community and pray of the bumper harvest. He said that the adi community mostly residing in Siang belt celebrate one of the biggest festival ‘Unying Aaran festival’, it is like a beginning of a new year and from today we start a new beginning. This year the celebration committee have made a big change and did not call any chief guest, guest of honour and special guest while everyone are guest and all are treated as god. However there ar crunch of resource but it is special day for us and we celebrated with great enthusiast. He inform that several cultural team from Jomo village and team from Pasighat are also participating and they will visit to all members of the community from today onward and will pray to almighty for a bumper harvest and happy living and well being of all community on earth. Senior citizen Dipang Tatak, Telem Melong, Adoli BIngab among several other address the gathering and share their experience on community living and provided their suggestion for a communal harmony and unity.